Photo by Magic Foundry, Flickr. LONDON, March 20 (Reuters) – The last British tin mine closed in 1998. When South Crofty ceased operating, it brought the curtain down on two millennia of tin mining in the southwestern county of Cornwall. However, hope springs eternal in Poldark country, as the region has been dubbed after the hugely successful television series based on the eponymous novels of Winston Graham. Two companies are now actively looking at reviving Cornwall's tin fortunes. Strongbow Exploration is focused on South Crofty itself, which needs to be dewatered before any new mining can occur. Strategic Minerals is drilling the Redmoor site, a historic tin mining area also hosting tungsten reserves. 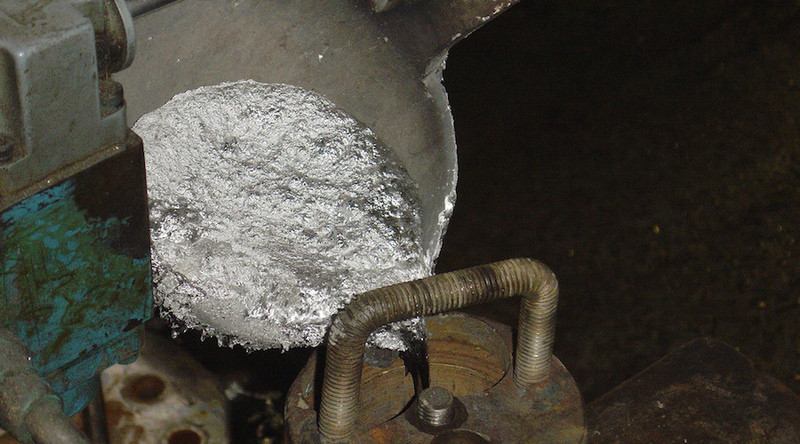 Both companies will take heart from the fact that the London tin price, although off January's 13-month high of $22,000 per tonne, is still holding just below there at a current $20,835. 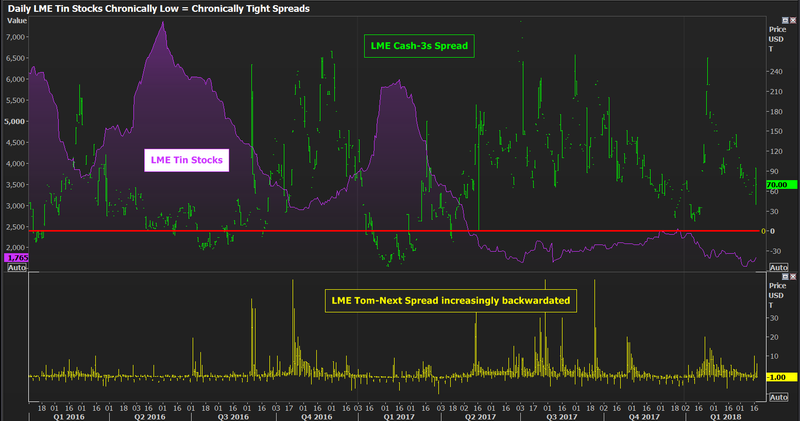 The London Metal Exchange (LME) contract, moreover, seems to be signalling extreme tightness with registered stocks chronically low and time-spreads chronically backwardated. The only problem is that there is another market in Shanghai which is signalling exactly the opposite. This "double vision" in the tin market is nothing new but the contrast is getting ever starker and there is more metal moving from China to the rest of the world than meets the eye. LME stocks are super-low at a current 1,765 tonnes, or 1,535 tonnes if you strip out the 230 tonnes of "cancelled" metal awaiting physical load-out from the exchange's warehouse system. A year ago they were above the 5,000-tonne level and three years ago there were over 10,000 tonnes of the soldering metal in LME warehouses. 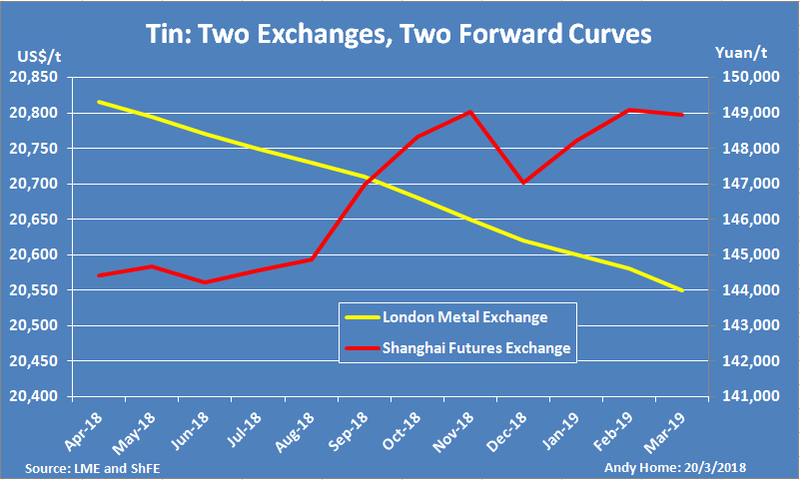 Unsurprisingly given this low physical liquidity base, the front part of the LME tin curve has been in continuous backwardation for almost a year. The benchmark cash-to-three months time-spread was valued at a backwardation of $70 per tonne at Monday's close. That's a bit looser than the cash premium of over $200 per tonne seen in late January. But spread tightness is becoming hard-wired into the London market with "tom-next", the shortest-dated spread of them all, spending as much time in backwardation as in contango these days. The tightness would be even more acute, were it not for the LME's lending rules on dominant long position holders such as the one currently sitting on 50-80 percent of exchange tin stocks. If you throw cash and "tom-next" positioning into the mix, there are actually three significant longs gracing the LME's daily report, one of them with positions equivalent to over 90 percent of available stocks. Yet despite a constant incentive to deliver metal into the LME system, arrivals have totalled just 1,305 tonnes this year and have failed to offset departures. The LME tin contract's low and declining liquidity is undoubtedly accentuating the spread tightness but the fact that this has been going on for almost a year does seem to be signalling an underlying short-fall of available metal. Or at least outside of China. Things look very different seen from Shanghai. Stocks registered with the Shanghai Futures Exchange (ShFE) stood at 5,048 tonnes as of last Friday's report, up slightly on the start of the year. They have been hovering around the 5,000-tonne level since the start of January. Unlike the LME, there is no sign of significant tension within the spread structure, which, barring a kink in December of this year, is in contango with forward prices trading above nearby months. The inference is that there is no shortage of tin in China. Although it's common knowledge that the country has been the driver of metals demand for many years, it's easy to forget that when it comes to tin, China is also the world's largest producer. Its refined tin production has recently been boosted by imports of raw materials from neighbouring Myanmar. Four Chinese companies were in the top 10 list of global producers last year, according to the International Tin Association (ITA). Three of them lifted production, in the case of the world's fourth largest tin refiner, Yunnan Chengfeng, by a startling 33.3 percent. Given all this evidence of feast, it's a wonder that the country isn't exporting more tin, particularly given the removal last year of export taxes. China's exports of tin metal did accelerate last year to 2,180 tonnes from 735 tonnes in 2016 but the country remained a net importer to the tune of 1,800 tonnes. Imports and exports of "tin products", meanwhile, largely balanced themselves out. Well, that's what the official figures say anyway. The ITA estimates that total outbound flows, including "unreported" exports, were actually around 11,000 tonnes last year. Tom Mulqueen, the ITA's markets manager, told the Reuters Global Metals Forum earlier this month that "it is likely that China will continue to be a net exporter of tin in 2018 as a result of its high domestic stock levels and ongoing ramp-up of processing trade of imported tin concentrate." The ITA is forecasting total exports, including those of the "unreported" kind, to rise slightly to 12,000 tonnes this year, depending on price differentials and the continued availability of raw materials from Myanmar. Now, it's not the first time in recent history that tin has seeped out from China without making it into the official customs count. And, judging by LME contract's evident struggle to attract sufficient units to break the grip of continuous backwardation, the world outside China needs these units. But there's a salutary lesson here for those such as Strongbow and Strategic Minerals looking to revive those old Poldark tin mines in Cornwall. The London market is only one half of the picture when it comes to tin price signals. The other, very different half is located in Shanghai. Linking the two is a stream of exports and you can't see most of them at all.